East Timor, officially the Democratic Republic of Timor-L'este, is a country in Southeast Asia comprising the eastern half of the island of Timor, the nearby islands of Atauro and Jaco, and Oecussi-Ambeno, an exclave of East Timor on the northwestern side of the island, surrounded by Indonesian West Timor. The small country of 5,376 square miles (14,609 square kilometers) is located about 400 miles (640km) northwest of Darwin, Australia. Despite its natural resources, East Timor has the lowest per capita income in the world (US$400 per annum). The unemployment rate was estimated at 50 percent in 2001. About 42 percent of the East Timorese live below the poverty line. Between 1999 and 2002, East Timor received $2.2 billion in foreign aid. A colony of Portugal until 1974, with the Philippines, East Timor is one of only two predominantly Roman Catholic countries in Asia. During a period of occupation by Indonesia, the Catholic Church featured in East Timorese resistance to foreign rule. Ownership of oil resources is one issue yet to be resolved. The highest point of East Timor is Mount Ramelau (also known as Mount Tatamailau) at 9,721 ft (2,963 meters]). The climate is tropical, generally hot and humid, and is characterized by distinct rainy and dry seasons. The capital, largest city, and main port is Dili, and the second-largest city is the eastern town of Baucau. Dili has the only functioning international airport; airstrips in Baucau and Oecusse are used for domestic flights. Dili's airport runway is unable to accommodate large aircraft. Natural resources include gold, petroleum, natural gas, manganese, and marble. Natural hazards include floods and landslides, earthquakes, tsunamis, and tropical cyclones. Widespread use of slash-and-burn agriculture has led to deforestation and soil erosion. Australoid people who populated New Guinea and Australia arrived in Timor about forty thousand years ago. Around 3000 B.C.E., a second migration brought Melanesians, who later colonized the islands of the Pacific Ocean. Lastly, proto-Malays arrived from southern China and northern Indochina. The country's mountainous terrain resulted in these groups remaining separate, and explains the linguistic diversity in East Timor today. Timor was incorporated into Chinese and Indian trading networks of the fourteenth century as an exporter of aromatic sandalwood, slaves, honey, and wax. The island had a number of small chiefdoms in the early sixteenth century, including the Wehale Kingdom in central Timor, with its capital at Laran, West Timor, with which the Tetum, Bunaq, and Kemak ethnic groups were aligned. The Portuguese were the first Europeans to arrive in the sixteenth century. They established outposts in Timor and in some surrounding islands, which were lost to Dutch control by the middle of the seventeenth century. The area became a Portuguese colony in 1702. The Netherlands were formally given West Timor in 1859 through the Treaty of Lisbon. The Hague Treaty of 1916 established what became the international boundary between East Timor and Indonesia. In late 1941, Portuguese Timor was briefly occupied by Dutch and Australian troops, fighting the Empire of Japan. When the Japanese landed and drove the small Australian force out of Dili, the mountainous interior became the scene of a guerrilla campaign, known as the Battle of Timor from 1942-1943, waged by Allied forces and Timorese volunteers against the Japanese. The struggle resulted in the deaths of between 40,000 and 70,000 Timorese. Portuguese control was reinstated after the end of the war. In 1974, Portugal abandoned East Timor, which declared itself independent on November 28, 1975. Indonesian forces invaded nine days later. Indonesia alleged that the East Timorese Fretilin party, which received support from the People's Republic of China, was communist. Fearing a Communist domino effect in Southeast Asia, the United States and Australia did not object to the pro-Western Indonesian government's actions. The territory was declared the 27th province of Indonesia in July 1976 as "Timor Timur." The East Timorese guerrilla force, Falintil, fought a campaign against the Indonesian forces from 1975 to 1999. Indonesian rule was marked by violence, such as the Dili massacre, in which about 250 youngsters were killed at the Santa Cruz Cemetery in on November 12, 1991, and the Liquiçá Church Massacre, in which pro-Indonesian militia killed 200 in April, 1999. Attacks on civilian populations were given only passing notice in the Western press. Death tolls reported during the occupation varied from 60,000 to 200,000. Following a United Nations sponsored agreement between Indonesia, Portugal, and the United States, the East Timorese voted for full independence in a referendum on August 30, 1999. But violent clashes broke out soon afterward, so a peacekeeping force (INTERFET, led by Australia) intervened. Sporadic armed raids continued from across the border. As these raids were repelled, the militias dispersed and INTERFET was replaced by a UN force. Portugal recognized independence on May 20, 2002, and East Timor joined the UN on September 27 of that year. 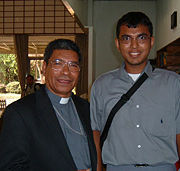 In 1996, Bishop Carlos Filipe Ximenes Belo and José Ramos-Horta, two leading East Timorese activists for peace and independence, received the Nobel Peace Prize. But in April, 2006, a rally in support of 600 dismissed East Timorese soldiers turned into rioting. Five people were killed and over twenty thousand fled their homes. Fierce fighting between pro-government troops and disaffected Falintil troops broke out in May. Contributing to the unrest were the perception of the unfair distribution of oil funds and the poor organization of the Timorese army and police. Prime Minister Mari Alkatiri called the outbreak of violence a "coup" and welcomed offers of foreign military help. Australia, Malaysia, New Zealand, and Portugal sent troops. On June 21, 2006, President Xanana Gusmao asked Prime Minister Mari Alkatiri to step down. Jose Ramos Horta was appointed as his successor on July 8, 2006. In April 2007, Gusmão declined another presidential term. In the build-up to the April 2007 presidential elections, there were renewed outbreaks of violence in February and March 2007. José Ramos-Horta was inaugurated as President on May 20, 2007 following his election win in the second round. Gusmão was sworn in as Prime Minister on August 8, 2007. President Ramos-Horta was critically injured in an assassination attempt on February 11, 2008 in a failed coup apparently perpetrated by a renegade soldier who died in the attack. Prime Minister Gusmão also faced gunfire separately but escaped unharmed. The Australian government immediately sent reinforcements to East Timor to keep order. The head of state of the East Timorese Republic is the president, who is elected for a five-year term. Upon election, the president appoints the leader of the majority party or majority coalition. As the head of government, the prime minister presides over the Council of State, or Cabinet. 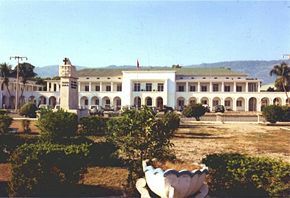 The unicameral Timorese parliament is the National Parliament of East Timor or Parlamento Nacional, whose members are elected to a five-year term. The number of seats can vary from a minimum of 52 to a maximum of 65, though currently it has 88 members (in 2006). The East Timorese constitution was modeled on that of Portugal. Timor was best known for its sandalwood. In late 1999, Indonesian troops and anti-independence militias destroyed about 70 percent of the economic infrastructure, and 260,000 people fled west. The United Nations led a massive international program over the next three years, staffed by civilian advisers, 5,000 peacekeepers, and 1,300 police officers, to rebuild both urban and rural areas. Agricultural products include coffee, rice, corn, cassava, sweet potatoes, soybeans, cabbage, mangoes, bananas, and vanilla. Exports in 2005 totaled US$10 million, excluding oil. The sole destination for exports was Indonesia. Imports in 2004 totaled US$202 million and comprised food, gasoline, kerosene, and machinery. With international guidance, much of East Timor's agriculture sector was converted from subsistence crops including cassava, cowpeas, and sweet potatoes to cash crops like coffee and coconuts to create an export-oriented economy. This effort failed due to low global market prices. Meanwhile, consumer prices rose by 4 to 5 percent in 2003 and 2004. Lacking its former subsistence crops, East Timor entered 2005 with food shortages. Extensive drought in 2003 and the gradual diminishing of the international presence reduced non-petroleum GDP growth. In 2007, bad harvests led to deaths in several parts of the country. In November 2007, eleven subdistricts still needed food supplied by international aid. Efforts are being made by international NGO's, like Seeds for Peace to improve agriculture, replace slash-and-burn traditional cultivation with less destructive techniques, and improve varieties of seeds to introduce higher yields and increased nutritional value for staple foods like rice, peanuts, and maize. Today, the country faces challenges in rebuilding infrastructure, strengthening the civil administration, and generating jobs for young people. The Portuguese colonial administration granted a concession to Oceanic Exploration Corporation, (OCEX.OB) of Denver, Colorado, to develop the petroleum deposits of the Timor Sea. Before development could begin the Indonesians invaded. The Timor Gap Treaty, in 1989, divided Timor Sea petroleum resources between Indonesia and Australia. This established guidelines for joint exploitation of seabed resources in the area of the "gap" left by then-Portuguese Timor in the maritime boundary agreed between the two countries in 1972. Revenues from the "joint" area were to be divided equally. Woodside Petroleum and ConocoPhillips began development of some resources in the Timor Gap on behalf of the two governments in 1992. East Timor inherited no permanent maritime boundaries when it attained independence, repudiating the Timor Gap Treaty as illegal. A provisional agreement (the Timor Sea Treaty, signed when East Timor became independent), defined a Joint Petroleum Development Area, and awarded 90 percent of revenues from existing projects in that area to East Timor and 10 percent to Australia. The first significant new development in the development area since independence is the largest petroleum resource in the Timor Sea, the Greater Sunrise gas field. Only 20 percent of the field lies within the joint area and the rest in waters not subject to the treaty (though claimed by both countries). The initial, temporary agreement gave 82 percent of revenues to Australia and only 18 percent to East Timor. The Government of East Timor has sought to negotiate a definite boundary with Australia at the halfway line between the countries, in accordance with the United Nations Convention on the Law of the Sea. Australia preferred to establish the boundary at the end of the wide Australian continental shelf, as agreed with Indonesia in 1972 and 1991. Normally a dispute such as this could be referred to the International Court of Justice or the International Tribunal for the Law of the Sea for an impartial decision, but the Australian government had withdrawn itself from these international jurisdictions (solely on matters relating to maritime boundaries) shortly before Timorese independence. Nevertheless, under public and diplomatic pressure the Australian government offered instead a last-minute concession on Greater Sunrise gas field royalties alone. In July, 2005, an agreement was signed under which both countries would set aside the dispute over the maritime boundary, and East Timor would receive 50 percent of the revenues (estimated at about US$20 billion over the lifetime of the project) from the Greater Sunrise development. Other developments within waters claimed by East Timor but outside the joint development zone continue to be exploited unilaterally by Australia, however. The returns from the development of oil and gas resources in 2006 began to supplement government revenues above expectations - the result of high petroleum prices - but did little to create jobs, because the gas is piped to Australia for refining and processing. The population of East Timor was over one million in the 2004 census, up from about 670,000 estimated in 1974 under Portuguese rule; growing rapidly in recent years because of one of the highest birthrates in the world, averaging almost eight live births per woman of childbearing age. Another factor is the return of refugees since independence in 1975. The population is concentrated around the capital city Dili. Most Timorese are of mixed Malayo-Polynesian and Melanesian/Papuan descent. The largest Malayo-Polynesian ethnic groups are the Tetun (100,000), primarily on the north coast and around Dili; the Mambae (80,000), in the central mountains; the Tukudede (63,170), in the area around Maubara and Liquiçá; the Galoli (50,000), between the tribes of Mambae and Makasae; the Kemak (50,000) in north-central Timor island; and the Baikeno (20,000), around Pante Macassar. The main tribes of Papuan origin include the Bunak (50,000), in the central interior; the Fataluku (30,000), in the east near Lospalos; and the Makasae, toward the eastern end of the island. There is a smaller population of people of mixed Timorese and Portuguese origin, known in Portuguese as Mestiço. The best-known East Timorese Mestiço's are Xanana Gusmão, the resistance fighter and now president of East Timor, and Prime Minister José Ramos Horta. Mário Viegas Carrascalão, Indonesia's appointed governor between 1987 and 1992, is also Mestiço. Upon independence, East Timor became one of only two predominantly Roman Catholic Christian countries in Asia (the other being the Philippines). A recent survey estimates that nearly 98 percent of the population are Roman Catholic, though local animist traditions persist. One percent are Muslim and one percent are Protestant. Smaller Hindu, Buddhist and traditional animist minorities make up the remainder. Church membership grew considerably under Indonesian rule, as Indonesia's state ideology "Pancasila Indonesia," which requires all citizens to believe in God, did not recognize traditional beliefs. Moreover, as a deep-rooted local institution, the Church not only symbolized East Timor's difference to Muslim Indonesia but played a significant role in the resistance movement, as personified by Bishop Carlos Filipe Ximenes Belo, the 1996 Nobel Peace Prize laureate. Historians note the struggle was not about religion. The Church's role has been acknowledged in the East Timorese constitution, but East Timor is secular and guarantees freedom of religion. East Timor's two official languages are Portuguese and Tetum, a local Austronesian language. Tetum, known as Tetun-Dili, grew out of the dialect favored by the colonizers at Dili. There are also a variety of non-official dialects known as Tetun-Terik. Indonesian and English are defined as working languages. Another 15 indigenous languages are spoken. The culture of East Timor reflects numerous influences, including Portuguese, Roman Catholic, and Malay, on the indigenous Austronesian and Melanesian cultures of Timor. Timorese legend holds that a giant crocodile was transformed into the island of Timor, or Crocodile Island, as it is often called. East Timor now has public holidays that commemorate historic events in the liberation struggle, as well as those associated with Catholic Christianity, and the Feast of the Crocodile on May 3. Illiteracy is widespread. Easily the most famous East Timorese author, the president, Xanana Gusmão, wrote two books during the struggle for independence. Also a poet and painter, he produced works describing the culture, values, and skills of the Timorese people. 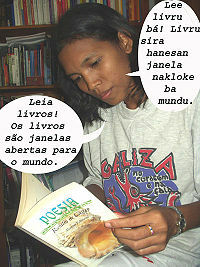 There is a strong oral tradition of poetry among the East Timorese. East Timor's music reflects its history under the control of both Portugal and Indonesia, who have imported music like gamelan and fado. The most widespread form of native folk music was the likurai dance, traditionally performed by women to welcome men home from war. A modern version of the dance is used by women in courtship. East Timorese popular musicians include the band Dili All Stars and Lahane, both of whom were associated with the independence movement, as well as Teo Batiste Ximenes, who grew up in Australia and uses folk rhythms from his homeland in his music. Refugee camps in Portugal mixed together East Timorese music with styles from other Portuguese colonies like Angola and Mozambique. The guitar is widely played there, with similar native kinds of string instruments. Foreign influences also include popular styles of music like rock and roll, hip hop, and reggae. Traditional East Timorese totem houses of the eastern region survive, although some Portuguese-style buildings can be found. These traditional dwellings are known as "uma lulik" (sacred houses) in Tetum, and "lee teinu" (houses with legs) in Fataluku. Also still practiced is the weaving of traditional scarves or "tais." An interesting point of culture is that all adult women (from the age of 15 years) are expected to remove all body hair (except on their head), even the hair on their forearms. East Timor now has public holidays that commemorate historic events in the liberation struggle, as well as those associated with Catholic Christianity. 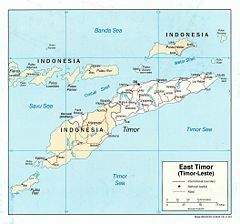 ↑ "Country profile: East Timor", BBC News, March 16, 2010. Retrieved December 27, 2011. ↑ Government of Timor-Leste, 2010 Census Results: Timor-Leste’s population grows slower than projected Retrieved December 27, 2011. ↑ 4.0 4.1 4.2 4.3 East Timor. International Monetary Fund. Retrieved October 2, 2011. This page was last modified on 26 September 2017, at 15:15.